If the option “Follow Cursor” is activated, the displayed screen is automatically selected based on the position of the cursor. You should deactivate this option, if the host application (e.g. SAP console) only needs a small part of the VT screen in the upper left corner. The zoom option enables zoom in/out with pinch gestures. A two finger tap temporarily shows the VT screen with its original zoom (24 rows and 80 columns). 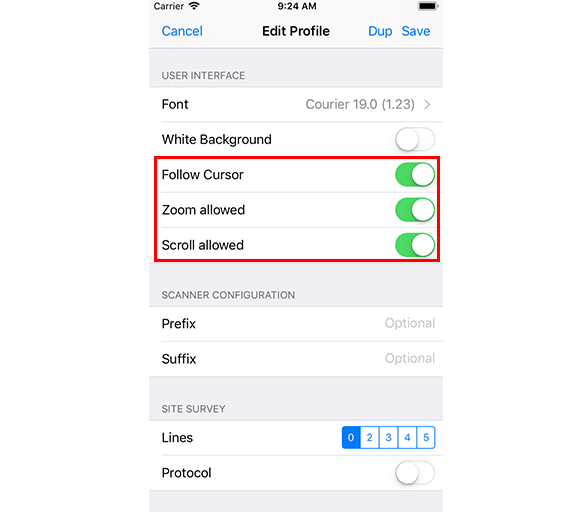 The scroll option enables moving the visible section of the screen by dragging the finger across the screen.